Dehradun, Oct 7 (IANS) Prime Minister Narendra Modi on Sunday said India is going through major social and economic changes and the resultant New India will prove to be a catalyst for global development. “India is witnessing rapid economic and social changes. The country is going through a big transformation. 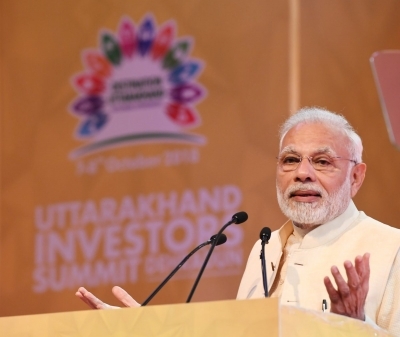 We are marching towards a New India,” Modi said at an investors summit here in Uttarakhand. “Every major institution in the world is predicting that in the coming decades, India is going to be the driving engine of world growth,” he added. Modi said India’s economy had stabilized over the last few years, fiscal deficit had come down, inflation was under control and the middle class was rising. “The scale and speed at which reforms are happening are unprecedented. In the last two years, the central and state governments have ushered in more than 10,000 reforms. Thanks to this, India has made a significant jump of 42 points in the global ‘ease of doing business’ index,” the Prime Minister said. Modi said the Goods and Services Tax (GST) had been the “biggest tax reform since independence” that had made the entire country into a single market and had widened the tax base. He said infrastructure development was taking place at a “record speed” with more than 10,000 kilometres of national highways built in the last one year.